Click to print graphic; it may fit in your scriptures (not because I planned it that way; I’m still trying to learn how to do pdf’s. 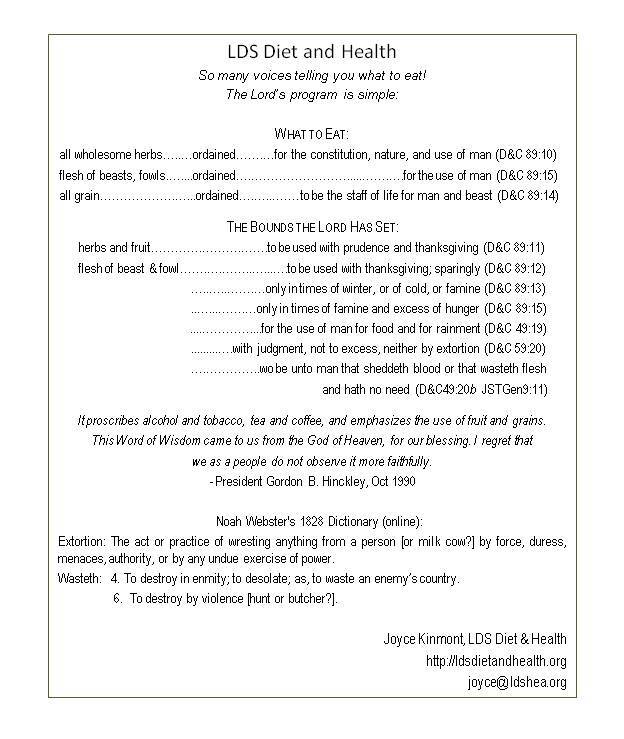 So many voices telling you what to eat! It proscribes alcohol and tobacco, tea and coffee, and emphasizes the use of fruit and grains. we as a people do not observe it more faithfully. the Internet, or other sources. Extortion: The act or practice of wresting anything from a person [or milk cow?] by force, duress, menaces, authority, or by any undue exercise of power. Wasteth: 4. To destroy in enmity; to desolate; as, to waste an enemy’s country. 6. To destroy by violence [hunt or butcher?]. Pingback: The Washington County Animal Shelter: the best way to save animals?